A Nazi Warship's Goodwill Call to ... Baltimore? Anna Marie Taylor holds her PhD in Spanish, with a special emphasis on Latin American literature, from the University of Wisconsin, Madison. She is the co-editor, with Richard Lerner, of James Lerner's posthumous memoir Course of Action: A Journalist's Account from Inside the American League Against War and Fascism and the United Electrical Workers Union 1933-1978. The Emden in 1928. Credit: German Federal Archives. Reports that the Nazi warship Emden would soon arrive in Baltimore on a goodwill tour began appearing in area newspapers in April 1936. The Baltimore Sun later reported that "while steaming up Chesapeake Bay" on April 20, the 494-foot vessel stopped and dropped anchor five miles outside of Baltimore. The 624 officers and cadets "stood in formation as Captain Hans Bachman delivered an address in observance of Adolf Hitler's birthday." At the conclusion of the ceremonies "all those present shouted 'Heil Hitler' three times while their arms were extended in the Nazi salute." The ship later fired a salutary shot near Fort McHenry before docking in Baltimore for a ten-day reception. The list of scheduled activities, spearheaded by the mayor and a number of German-American cultural groups in the area, included welcoming ceremonies at the dock, courtesy visits between the ship's officers and city officials, receptions, a dance for the cadets at nearby Goucher College, and public tours of the ship. The Baltimore Branch of the American League Against War and Fascism began organizing a committee of fifty people headed by Dr. Edward L. Israel of Har Sinai Congregation to protest the city's celebration. The committee, including Thurgood Marshall of the local chapter of the NAACP, demanded in a declaration and meeting with the mayor that public festivities for the warship be cancelled. 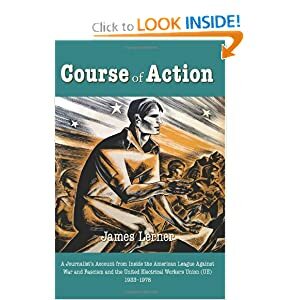 James Lerner describes the Baltimore events surrounding the Emden in his posthumous memoir, Course of Action: A Journalist's Account From Inside the American League Against War and Fascism and the United Electrical Workers of America (UE) 1933-1978. Lerner, then in his twenties, was a principal organizer for the League from its founding in 1933 until it ended in 1939. Lerner also wrote a column called "Youth Speaks" for the League's magazine, The Fight Against War and Fascism. The League's goals were to strengthen the movement to keep the U.S. from entering the war in Europe and to simultaneously educate the American public about the rise of fascism in Germany, Italy, Spain, and Japan. To these ends, the League organized large demonstrations and boycotts, including the famed women's boycott of silk stockings from Japan. The League also funded medical aide to war victims in Spain and China. In the year prior to the Emden goodwill tour, Lerner had spent several weeks in Baltimore helping to establish a branch of the League there. It was formed by a wide range of groups, including the League of Women Voters, Protestant and Jewish clergy, labor unions, the Urban League, NAACP, and YMCA. Following its founding convention in November 1935, it became one of the largest and most active of the League branches. The coalition politics promoted by the League and documented in Lerner's memoir was in full evidence five months later in April 1936 when the Emden was about to pull in to the city's harbor. The fifty signers of the protest to the City about the Emden's mission included the Ladies Garment Workers Union, the Jewish Building Trades Council, members of the Johns Hopkins University faculty, and the People's Unemployment League. According to Lerner, after the protest committee made its objections known to the city about the planned reception for the warship, the local American Legion denounced the composition of the committee, stating that "at least some of the signers of the protest proclamation lean to the radical and communistic elements of the city." Lerner describes the demonstration of more than 2,000 people that marched through Baltimore to the waterfront as the Emden arrived.They carried posters condemning repression and human atrocities in Germany. Caricatures of Adolf Hitler stood out in the crowd. While the warship was anchored in Baltimore, German-American groups held their planned receptions and other events for the ship's crew, including a soccer match. The Sun reported that the mayor and captain exchanged visits and the Emden's officers made an official visit to the U.S. Naval Academy. The Sun noted that as the Emden pulled out of Baltimore on May 2, 1936, its band played "Deutchesland uber Alles" and "Anchors Aweigh." The committee of fifty prominent citizens and their corresponding civic groups organized by the League were not successful in getting the city to cancel its official welcome of the Emden. However, under growing pressure from the protesters, the American Legion cancelled its musical reception for the ship's arrival, and Goucher College canceled its dance for the German cadets. The committee's far greater success was to inform the public that the ship's "goodwill tour" was not a routine arrival of an international ship. By defining the meaning of a Nazi warship's presence at its waterfront, the dissenters effectively brought to Baltimore an awareness of the stark reality of fascism in Germany. By the end of the 1930s, fast-changing events in Europe leading to world war began outpacing the League Against War and Fascism's ability to respond and hold its broad-based and effective coalitions together. The League, already strained by internal dissensions, came to an end in 1939, when the Soviet-German Pact and the subsequent Soviet invasion of Finland caused a final rift among the League's leadership and members. The Lerner memoir gives us one of the first comprehensive views into the League Against War and Fascism and its impressive efforts at coalition politics during the national and international crises of the 1930s. Perhaps Lerner's book will stimulate further study of the League. In particular, we might look to the League as an inspiration for the coalition building that may be essential to facing the global threats and challenges of our twenty-first century.